Commissioned in order to fit a specific niche in an office. 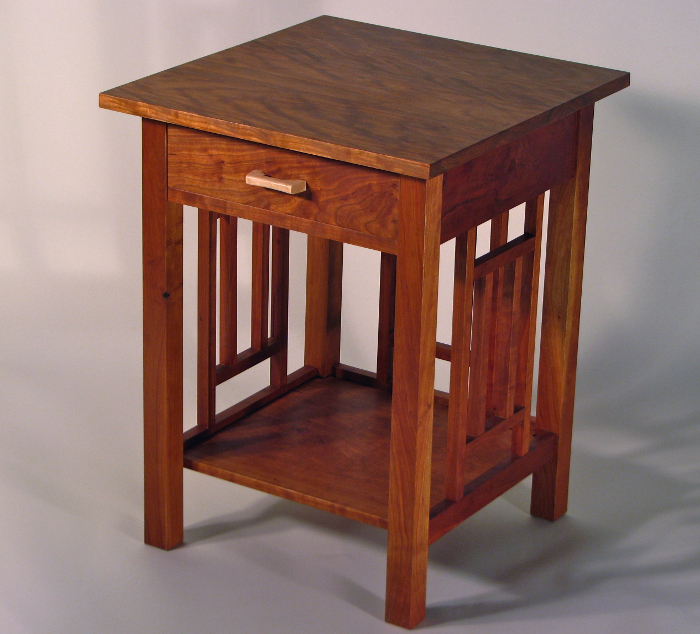 The table has classical proportions with details that reflect an early 20th century modern aesthetic. Reinforcing a motif begun with the Tiny Parabolic Table, the legs provide the drama in the design. The gently curving, tapering legs appear in tension as an athlete or dancer at the ready. Unusual curly walnut. Drawers that are made exquisitely are a pleasure to behold. Strong, light, and well proportioned, they seem to glide in and out of their case on a delicate puff of air. These drawers have been constructed with book-matched walnut fronts and cherry interiors. 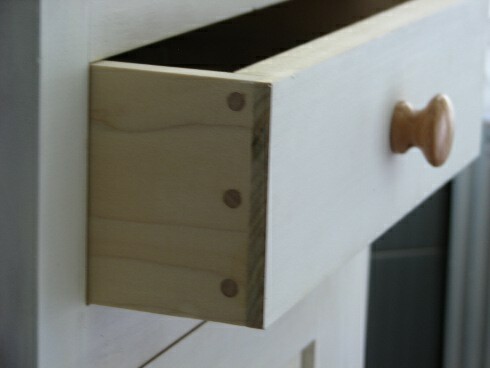 Hand made drawer pulls match the under-bevel on the table’s top. Not quite a coffee table and not really a footstool either. By client request this table is just large enough to accommodate a box of tissues and maybe a beverage. 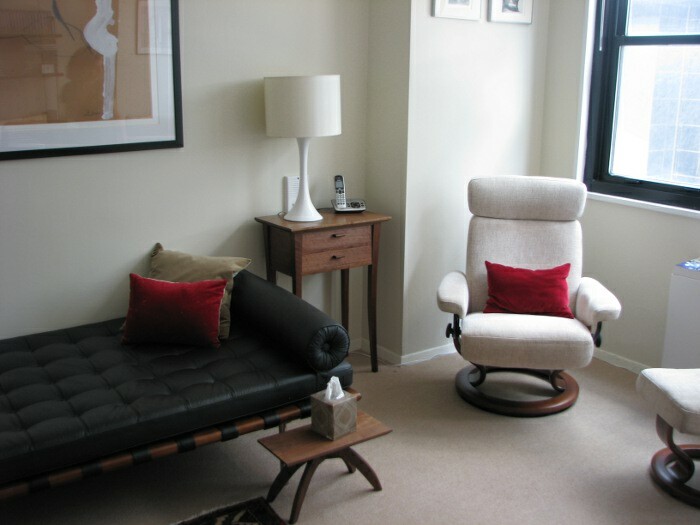 It is quite low in order to compliment a Mies van der Rohe (last director of the avant-garde Bauhaus Design School) Barcelona Couch. The sweeping arches of the legs compliment and soften the very rectilinear form of the couch. 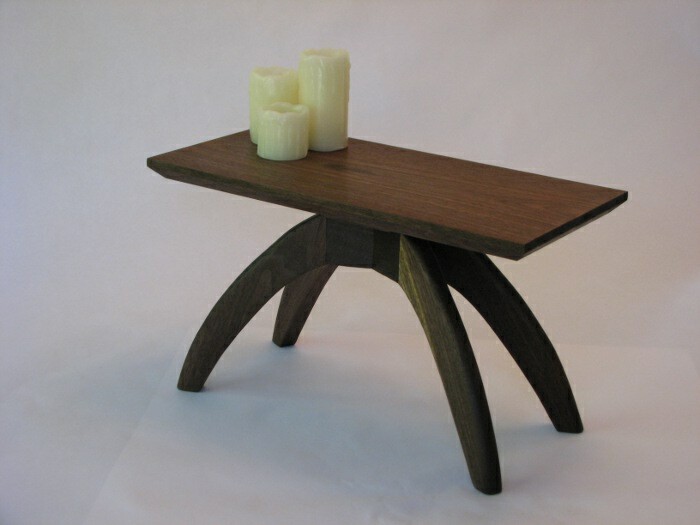 In solid black walnut. A soothing blend of forms, textures and colors where the furniture was designed and crafted to complement existing pieces and artwork. Influenced by both American and Chinese traditions in woodworking this cherry bedroom combination strives above all for balance. The interior frameworks seem to be repeating and dividing—as nature itself does. Elegant and informal. Turn-of-the-century, yet also fresh and modern. Black cherry with fir drawer interiors. 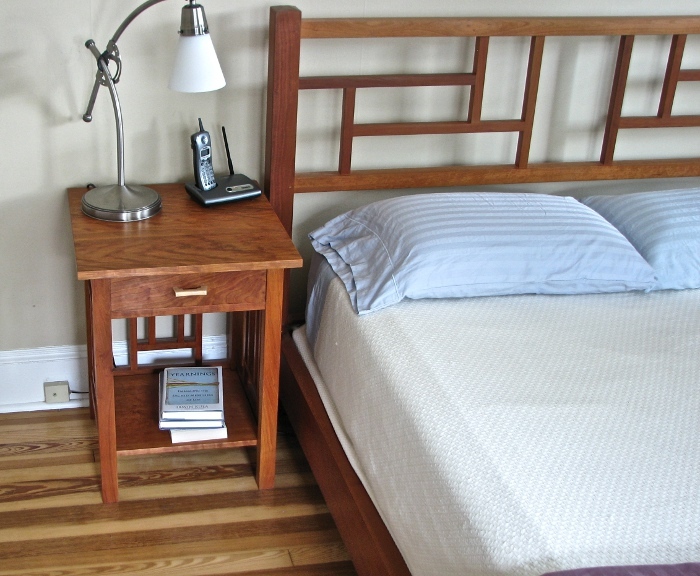 A nightstand works hard and is never completely clutter-free. Your nightstand should accommodate the real stuff kept next to a beds: an alarm clock, the phone, eyeglasses, what ever, and still look smashing. A shelf for reading material. A drawer for love letters or other items of privacy. 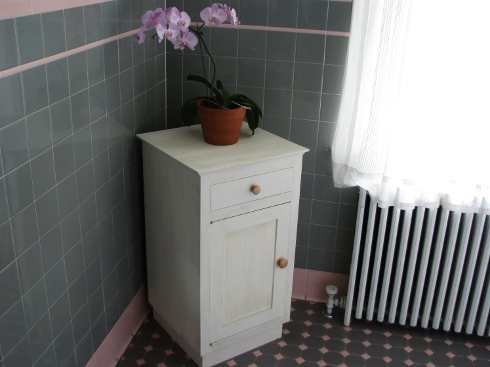 Standing alone as a small cabinet for a bathroom, this Shaker inspired cabinet features an inset door and drawer. A series of these together could easily form the foundation of built-in cabinetry. Finished in “Real Milk Paint” — an all natural finish so named because it includes casein, a dairy protein in addition to pigment, clay and limestone. An attractive yet more economical drawer construction than the hand-cut dovetail is the pinned rabbet drawer. A good choice for some built-ins and cabinetry destined for much harder wear than fine furniture.